The House of Austria has always boasted of being in possession of a small piece of the genuine Cross of Christ; and the Emperors Maximilian and Frederic III used to wear that relic about their persons, enclosed in a cross of gold. After the death of the latter, Leopold I. his successor, presented it to the widowed Empress Eleonore, daughter of Duke Charles II of Mantua, to comfort her in her widowhood; she kept it very carefully locked in a small box, adorned with crystal and enamel, and covered with silk. It happened that in the night of the 2nd February, 1668, a fire suddenly broke out in the Imperial Castle at Vienna, just below the apartments of the Empress Eleonore, and it soon reached the Imperial apartments, from which she escaped with considerable difficulty, before they were entirely consumed. On the following day search was made for the relic, and it was discovered amongst the ruins fortunately untouched by the conflagration, with the exception of the metal which was partly melted. The Empress was so rejoiced at the incident, that she ordered a solemn procession on that occasion, and resolved to found a Female Order, not only — as the statutes say — to commemorate the miraculous event, but also to induce the members to devote themselves to the service and worship of the Holy Cross, and lead a virtuous and religious life in the exercise of religion and works of charity. Pope Clement IX confirmed the new Order and its rights in his Bull : "Redemptoris et Domini nostri" (28th June, 1668), confiding to the Prince Bishop of Vienna, its spiritual management. The Emperor Leopold I not only sanctioned its statutes, but took the Institution under his special protection while the Empress Eleonore declared herself (18th September, 1668), its founder and chief patroness. The Order received the name of "Community of noble ladies", under the title of "the Star Cross" ; and the members were styled "Crossbearers, or ladies of the Star Cross", (after a constellation of that name at the South Pole). This Order is only bestowed on Princesses, Countesses, and other high-born ladies. The Empress, or a Princess of the Austrian House, is head patroness, who nominates the members, and selects two from amongst them for her assistants. Their number is unlimited, and entirely dependent on the pleasure of the head patroness. The festival of the Order is celebrated twice a year ; on the day when the Cross was found (3rd May), and on Holy-roodday (14th September). Mass for the departed souls of the patroness and members is usually held on the 6th February. The decoration of this Order (No. 22) which, by the bye, has been altered four times since the reign of Empress Maria Theresa—has the form of an oval medal with a broad blue-enamelled edging ; it encompasses the Austrian eagle with golden claws, upon which rests a green enamelled golden cross, mounted in brown wood. 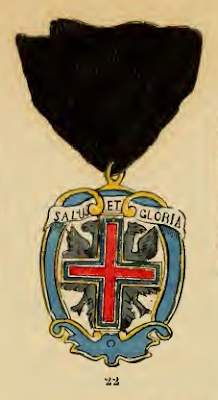 Upon it is, in black letters upon white ground, the motto of the Order : "Salus et Gloria" (Hail and glory). It is worn on the left side of the breast, suspended by a bow of black silk ribbon. The festival days (3rd May and 14th September), are set apart for the nomination of candidates, when the insignia are placed upon the altar, ritually consecrated and presented by the patroness, who is seated, to the candidate ladies, who are in a kneeling position before her.